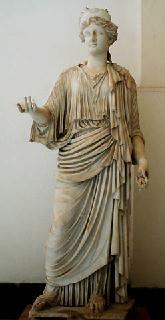 Geography/Culture: Greek: Attica, especially Rhamus where She shared a temple with Themis. Description: Originally self-conceived, self-perpetuating pastoral winged Goddess of the moon, justice and immortallity; Shapeshifting Spirit of the year's seasonal cycle; Oracular crone of autumn; rain and thunderstorm Maker. In patriachal times She became the Goddess Who brings divine retribution for acts of human injustice; She Who pursues the arrogant, insolent and wicked transgressors of the natural, right order of things with inflexible vengance. To Whom Sacred: ash-tree; apple-bough; swan and hyacinth coloured egg; stag; lamb; silver crown with stags embossed; the colour white; wheel (of the solar year); scourge. Male Associate: She was raped by Zeus when in Her seasonal swan-form. Nymph aspect, or epithet Adrasteia, She-Whom-None-Can-Escape, below. Also called Ichnaia Who is linked with Themis. Daughter of Nyx Who is linked with Car, Queen-Bee. Linguistic Note: Greek orthography alpha-delta-rho-alpha-sigma-tau-epsilong-iota-alpha, (adrasteia), perhaps from a privative d-iota-delta-rho-alpha-sigma-kappa-omega, the inevitable. Description: Oracular Crone of autumn; Goddess of thunder-storms, rain, retribution, and fate. To Whom Sacred: ash-tree; sheep; bow and arrows. Male Associate: She was nurse to the infant Zeus. Originally a title of Rhea-Cybele, Who is linked with Cybele, She-With-the-Axe. She was one of the Meliai, Who are linked with Melia. Nymph aspect, or title, of Nemesis, Due-Enactment, above. Linguistic Note: from Greek alpha-nu-alpha-gamma-kappa-eta, (anagke), of what must necessarily be so. Title, or alternate name for Nemesis, above. Ananke is very likely a variant of Anagke. worked on: December, June 1995; August 1991; July, August 1990.